A Christian, standing for the Federal parliament in Australia, recently lamented that he found it very difficult to get overt support from others in the churches. 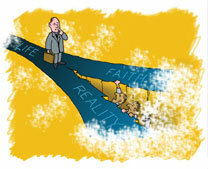 When pressed, the reluctant often respond, ‘You don’t mix politics and religion’. These people seem to have a misguided notion of what ‘separation of church and state’ means (and it’s not in the constitution of Australia, or the USA for that matter). It originally meant that no one Christian denomination should have favoured status as a ‘national church’, not that Christians should have no input or influence in government. Jesus taught that we should be ‘salt’ and ‘light’ to the communities in which we live (Matthew 5:13 ff.). Surely this includes every legitimate avenue of human endeavour, including government, which God ordained (Romans 13). Certainly, the Reformers, such as Luther and Calvin, did not regard withdrawal from public life as a pious thing to do. In much of Western society Christianity has all but died, because faith has been relegated to the realms of the mind, the emotions, the ethereal, the other-worldly. All this started in the once-Christian ‘West’, when scholars began abandoning the early history of the Bible. This did not begin with Darwin, but with Hutton (see pp. 50–55) in the late 1700s. The ‘science’ of Hutton and his disciples, including Darwin, provided a counterfeit history opposing the Bible’s. And if the history of the Bible fails, how can its theology stand? Of course no respectable evangelical professor would deny the ‘facts about our Lord’, but many do deny the history of Genesis 1–11. But without that history, the relevance of Jesus evaporates—if there was no real Fall where death entered the world because of Adam’s sin, causing all Adam’s descendants to die, what need is there for someone to die for us? As Dr Dudley Eirich says (pp. 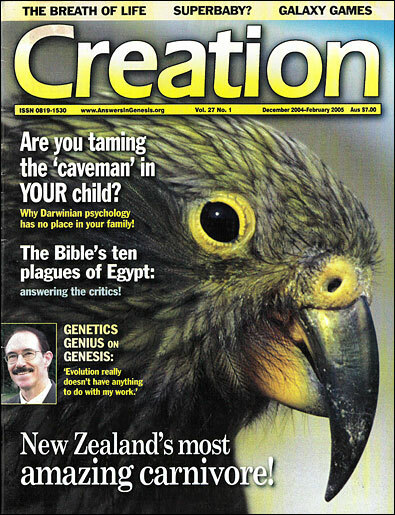 46–49), ‘Evolution destroys your faith in the Bible, because once you go down that slippery slope, you start questioning the Bible in other areas.’ And restoring the real history of the world, according to the Bible, transforms the lives of Christians who once thought they could not believe it, as microscopist Mark Armitage relates (pp. 14–17). I pray that as this issue of Creation goes out all who read it will be encouraged to believe the real history of the Bible and to trust the One who made everything and died ‘to reconcile all things to Himself’ (Colossians 1:15–23). Denney, J., Studies in Theology, London, p. 15, 1894 (cited from Kelly, D., Creation and Change, Mentor, Fearn, UK, p. 17, 1997). Return to text. Dr Martyn Lloyd-Jones, What mean these stones? Sermon preached 12 November 1977, Evangelical Action 2002(6):17–24, 2002. Return to text.